So, after a quick paus the training posts are back! 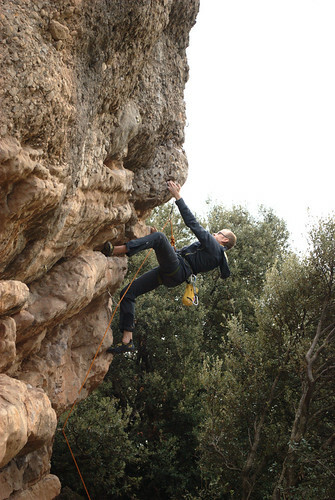 Visiting Sweden was great, coming back home to Catalonia was great, and climbing has been really good over Christmas. Plenty of work to finish for our little company but now I will really try to relax a little and climb and hopefully ski as well. I’ve been down to the gym a few times but finger pain has truly limited the quality training. Luckily David and his brother now has finished the lead wall and we can now all get truly pumped on some really steep routes. 6a+ of 30 degrees overhang? Phu. Well, for the next couple of weeks and until the finger is really good I will climb a little inside but really be careful. Instead I’ll try to enjoy the higher energy/lower weight my new LCHF-food has provided me with and the super high climbing psyche I have now and clean up some of the projects I’ve gathered the last year. It has started great, 7a from last year in Malpas de Trevil done, 7a+ tried and sent in two sessions (first real 7a+! ), and today a great 7a here in Montserrat, on the left wall of Agulla de Senglar. Both the 7a+ of yesterday and the 7a of today where just amazing stamina routes where it was all about keeping the pump under control and keeping on climbing. There is no way I would have done any of these three routes without the training and the change of diet. During the spring my friends Elin and Fredrik will stay here in Catalonia. It will be great with another couple of really psyched climbers, ready to go climbing most of the days! They had their first day here in Montserrat today and Fredrik went straight for the very good looking I Somni Diabólic on the great sector of Agulla del Senglar. I really hope he gets to send it during the spring, hopefully I’ll get him to write about this and the other routes he tries around northern Spain. And post photos as well. What do you say Fredrik? Try to do some longer granite routes in northern Norway this summer!